We went out to visit the Historic White Pine Village maintained by the Mason County Historical Society today. 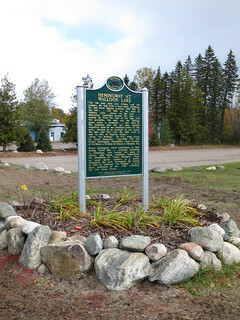 They have an interesting exhibit of a twenty or more buildings containing a variety of historic items, mostly from the white pine logging era of the 1880s-1900s. One of the buildings is a general store and it has a National Cash Register. This one is not as good an example as the others I have photographed but is still interesting. 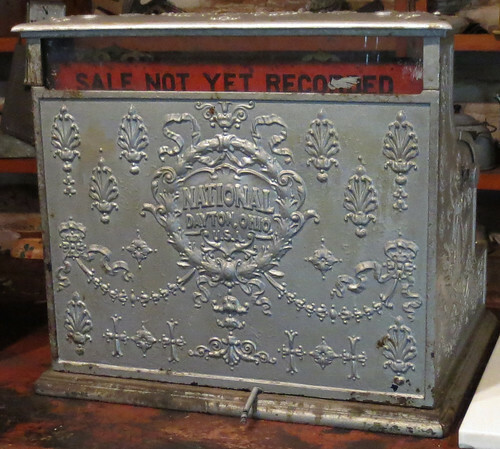 The cash drawer doesn't have one of those marble slabs on it for bouncing coins to test for a "true" ring. But the NCR logo on the back is complete, albeit a bit stained. This makes me realize what a great example that one down in Hico, Texas really is. 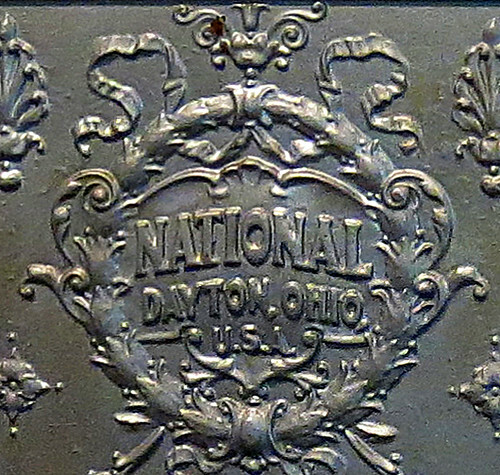 Click on the label "National Cash Register" below to find my other NCR posts. 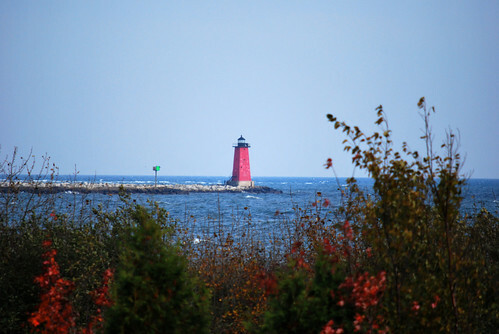 As we traveled around Michigan, I took pictures of a few of the many lighthouses that guard the edges of Lake Superior and Lake Michigan. I thought I would put several into a single blog post rather than show them as we moved around the state. Tonight as I started to look for sites to link to from this post, I discovered that there are some people that have put a lot of effort into "lighthouse blogging." This turns out to be a rather modest effort on my part. Remember when I pressed the button at the Great Lakes Visitor Information Center at the start of this trip? 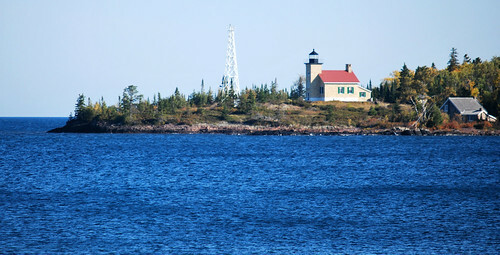 This was the lighthouse at Copper Harbor. 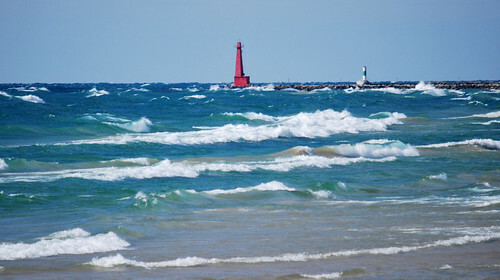 Next up was the Manistique East Breakwater. We had to travel about eight miles off the main roads to reach the Seul Choix (Only Choice) lighthouse near Gulliver. 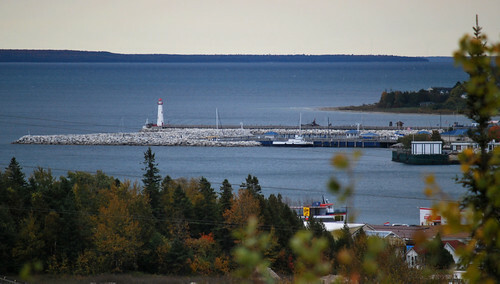 The relatively new St. Ignace Lighthouse is visible from an observation point along the highway a few minutes before reaching the Mackinac bridge. 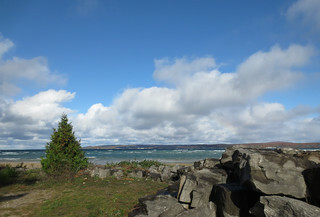 By the time we returned to the lake shore a couple of days ago, the winds had begun to pick up and were bringing in waves. In fact, sand was drifting across the road in many places near the water. 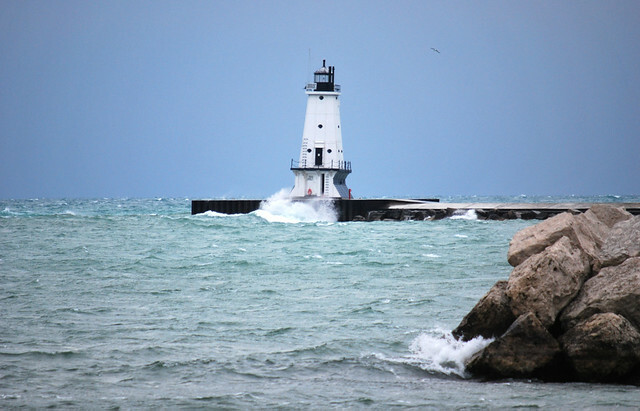 That made this view of the lighthouse at Muskegon more interesting. 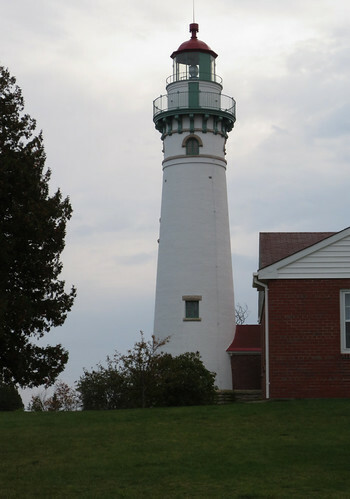 Finally, we reached our last two Michigan lighthouses on this trip. We are now in Ludington, waiting for the ferry to take us across to Wisconsin. This is our favorite lighthouse. 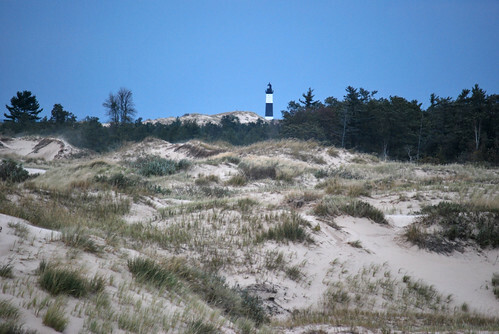 There is another one, at Big Sable Point, in the state park a few miles farther north. 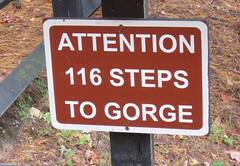 It isn't very accessible at this time of year after they close the road to the campground. 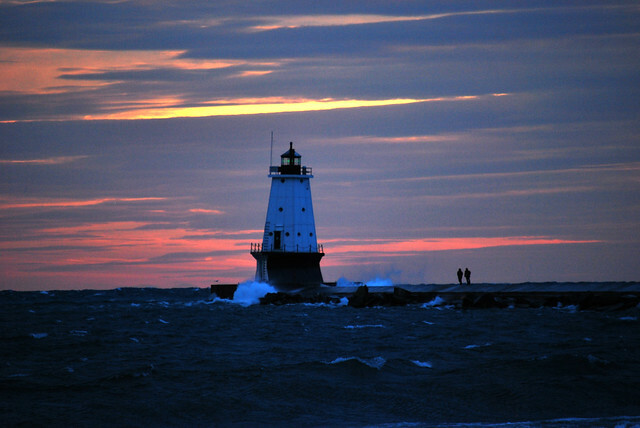 And we have gone back to the Ludington lighthouse to see it in different light. I expected that we would find about six cars in the parking lot on a Sunday afternoon. I was very wrong. The museum is used for civic events and this was the final day of the Grand Rapids Art Prize. This appears to be a very big deal. The sponsors claim it is the world's largest art competition. Offsetting the negative of a large crowd, the admission was free. 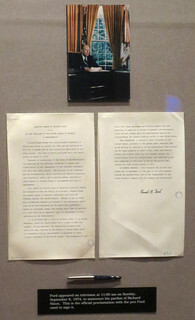 Like other presidential libraries, there is a public museum area with exhibits that cover major events during the president's term. This one takes the time to set the preliminary scene. The 1960s. Vietnam. Nixon. Soon it is 1974, and then, Watergate. Well these three exhibits certainly bring back memories for us old folks. 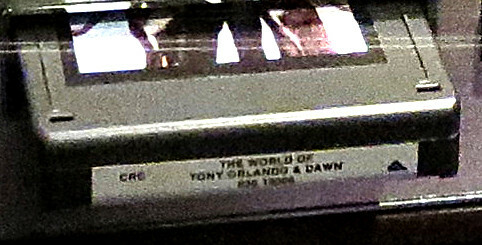 Wondering what tape is in the 8-track? 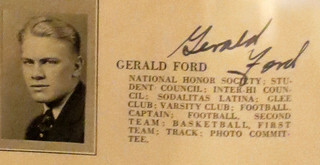 Then the biography section takes us through Ford's life and career. 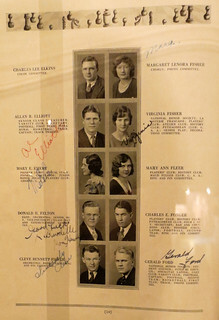 I sometimes wonder what it must be like to have fate place you on the same page of your high school yearbook as a famous politician or entertainer. Those awful pictures on display for the world. 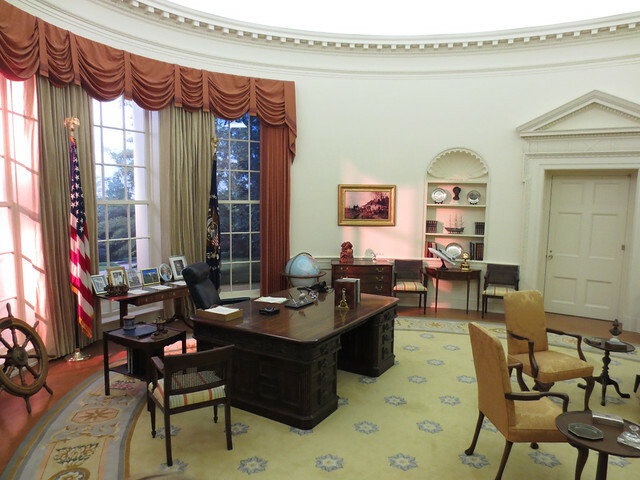 Presidential museums always have an oval office reproduction. Click on the "U.S. Presidents" in the left-hand column to see other examples visited on this blog. 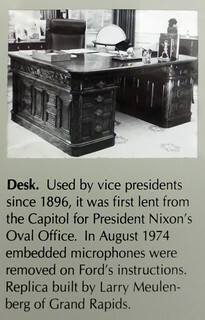 Extra efforts go into reproducing the president's desk. There are many of the usual artifacts in the library: fancy gifts from sultans and emirs, for instance. But this library has a few that are very special. 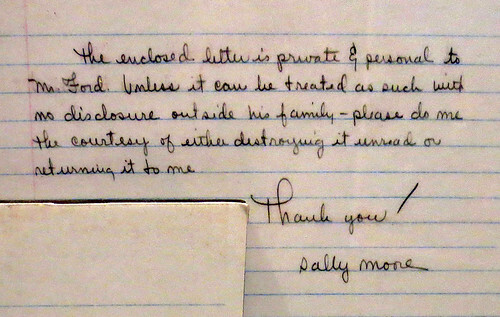 There is the Nixon presidential pardon and the pen used to sign it, of course. But, there are quite a few letters on display from unhappy citizens. Not the least, one of resignation from Ford's press secretary. No way was Jerald terHorst going to explain the pardon to the press. 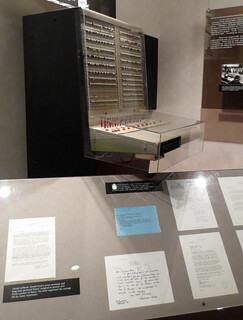 But also nicely preserved is the White House Switchboard where calls of protest came in along with this letter from game show host, Allen Ludden. 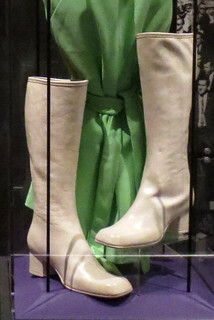 Since Ford was attacked by two women with guns during separate California incidents during September of 1975, these items are among the more unusual to be found in a presidential museum. 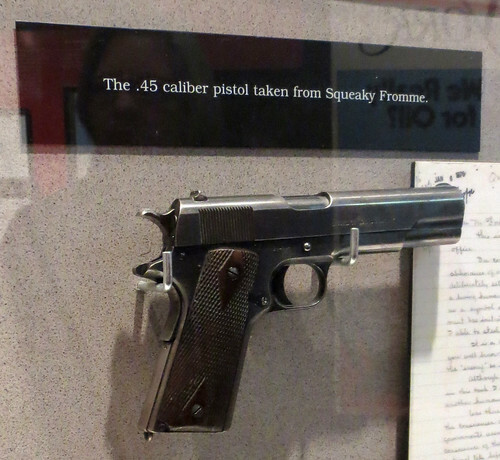 First, there is Squeaky Fromme's .45 automatic. 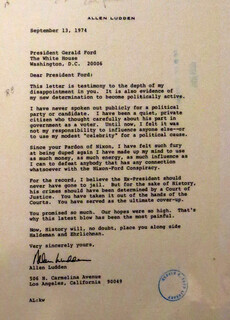 And there is Sally Moore's letter to Ford - with a cover note asking that it not be made public. I wonder if either of these people have been to the museum? Do you suppose terms of their parole prohibit that? 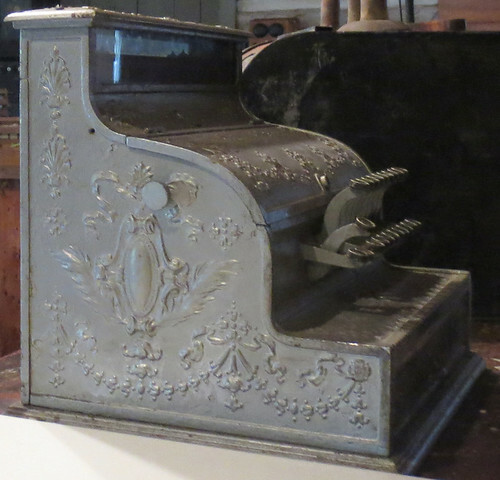 And here is one other presidential artifact that I was surprised to see. 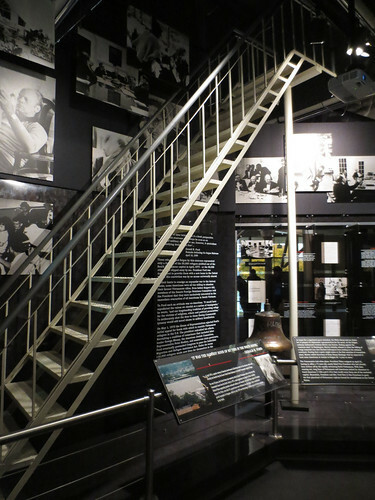 It's the ladder from the roof of the U.S. embassy in Saigon that we have seen so many times on film as the last desperate refugees tried to make it onto the last helicopter leaving the country. 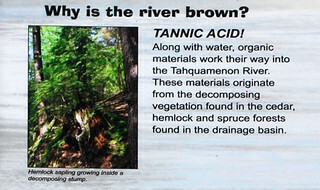 I had no idea it was preserved. The story can be found here. 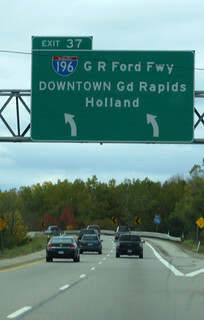 We stayed in Grand Rapids last night as my part of the trip involves some research in the area. 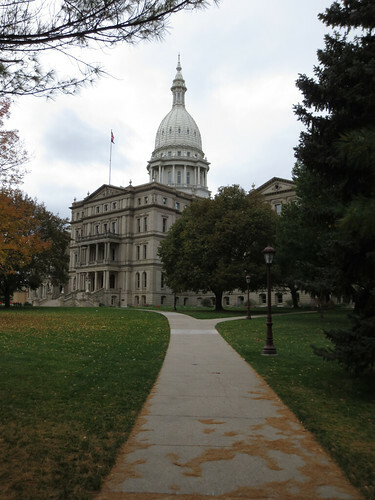 This morning, Sunday, we headed east to the state capital of Lansing to see the Capitol building. 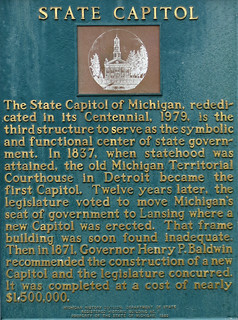 Lansing is about an hour's drive from our base here. Unfortunately, we had a cloudy day with some rain. Still, the Capitol looked handsome as we approached it. 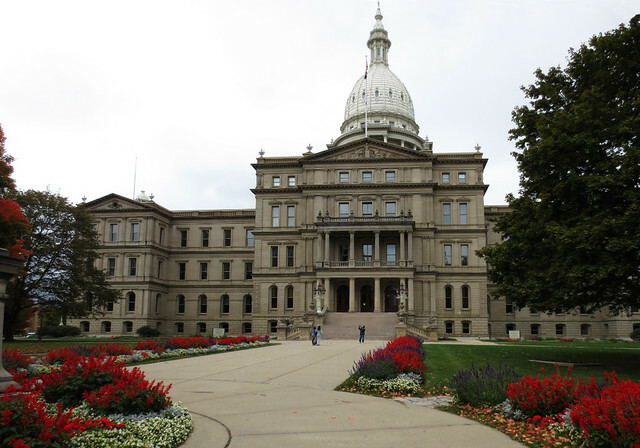 Lansing feels like a smaller town, although, at about 115,000 it certainly not one of the smallest capital cities. We took several pictures. 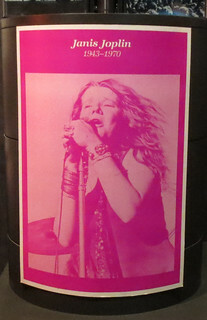 Click on one to go to the Flickr site and browse through them if you wish. Since it was Sunday we were unable to do an inside tour. 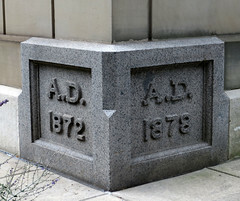 I did photograph the cornerstone and the historical markers. 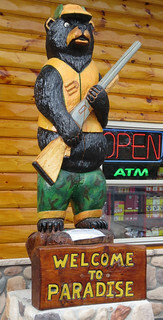 Since Lansing is also a big college town the restaurants are plentiful and we tried the MBC with good results for lunch. Linda notes that we are now entering my part of trip. 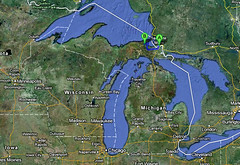 I planned the lower Michigan tour. As she says, now it's just museums, markers, cemeteries and libraries - old people's stuff. 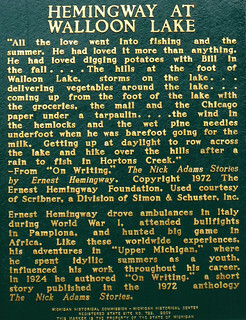 We were headed to Petosky, next, to enter Hemingway country. 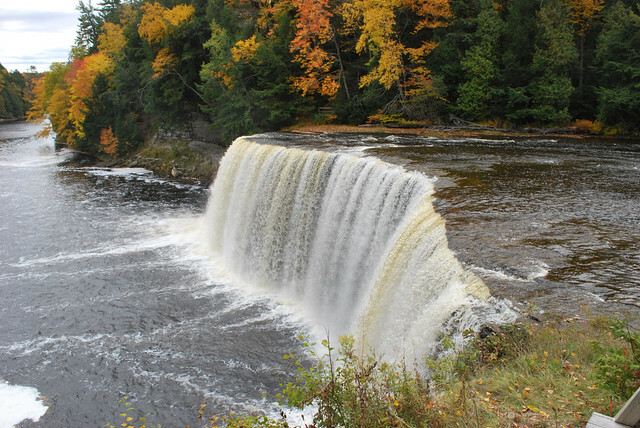 Young Ernest learned many of his outdoor skills during his family's summers spent in this area. 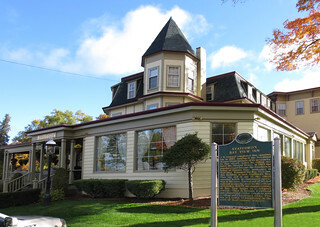 We called ahead and got the last room available at Stafford's Bay View Inn just north of Petosky. With a 125 year history in the area, this old-fashioned (no TVs in the rooms) inn offers a dining room with a great bay view, of course. Breakfast came with a rainbow dropping into the lake. Your experience may vary. For example, you might see a rainbow and have your camera with you! 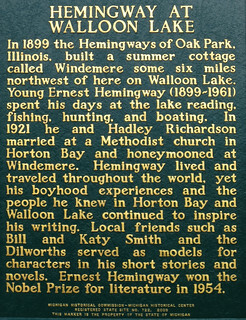 The next morning, we headed south making a stop at Hemingway's Walloon Lake marker. You won't just accidentally stumble onto the marker. 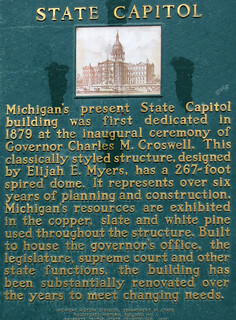 You'll need to use something like michmarkers.com to find it. 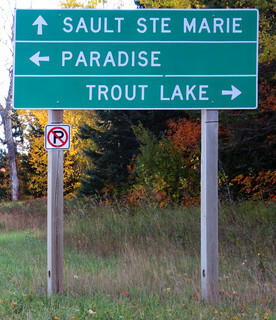 We finally left the upper peninsula after our day in the Sault Ste Marie area. 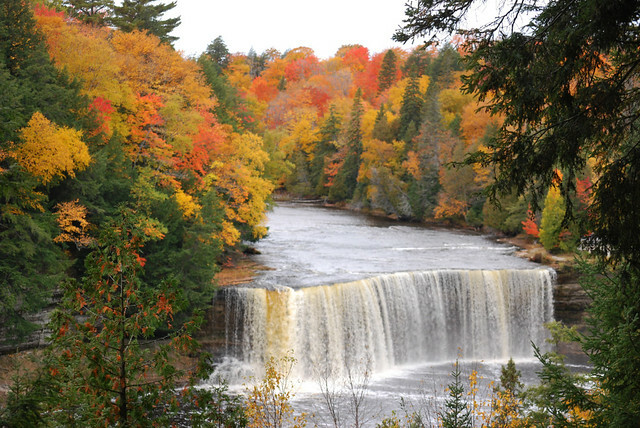 The short trip across upper Michigan was better than we ever imagined. 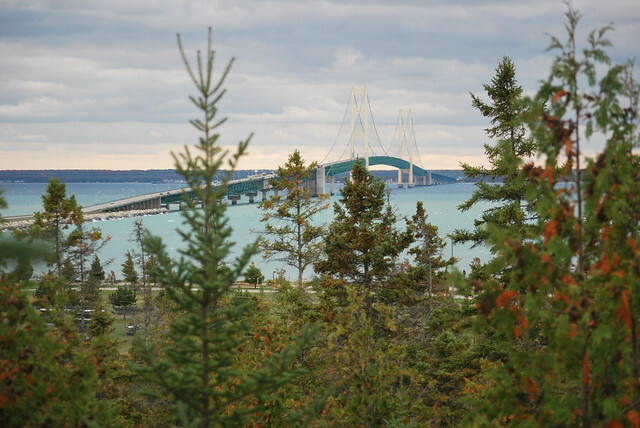 And what a fitting way to leave - we crossed the five mile long Mackinac bridge into Mackinaw City. By the way, both of those words, Mackinac and Mackinaw are pronounced the same way - as the "awe" in "awesome." Explanation here. 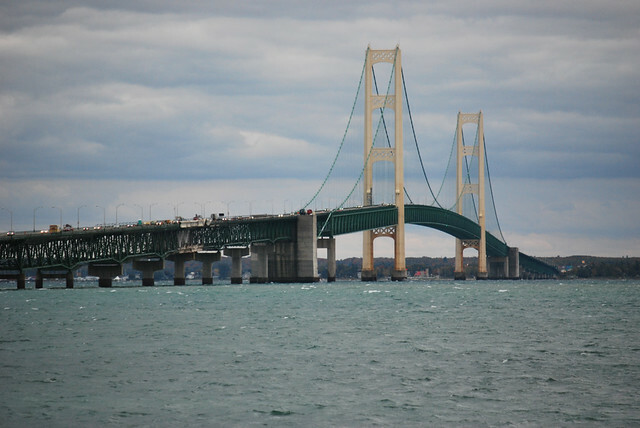 There are a couple of places to get a good view of the bridge before you pony up the $4 toll and go across. The first gives a nice aerial view, although it could use some tree trimming. And right before the toll plaza is another from water level. 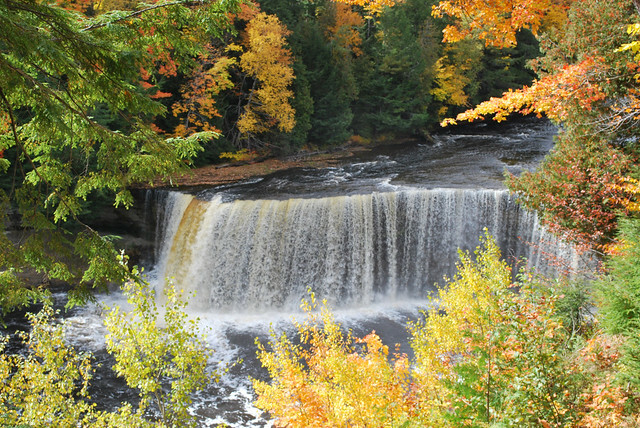 Yes, one more waterfall post from Michigan! 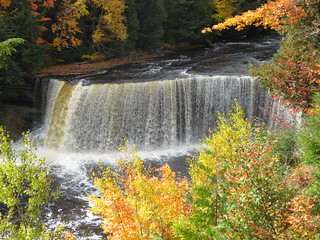 Friday, we spent much of the day at Tahquamenon Falls, "near" Sault Ste. Marie. I put the near in quotes because it takes a good hour and a half to reach it. 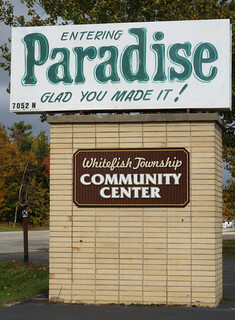 But, the good news is that it is located in Paradise. 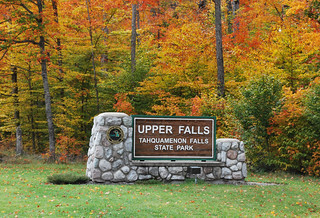 We spent our time at the Upper Falls which has the larger drop. 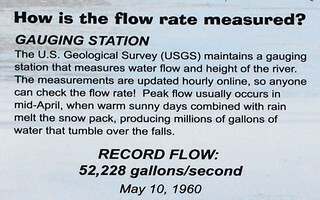 Water flow was much less than it would be in springtime, but is still enough to make a spectacular show. 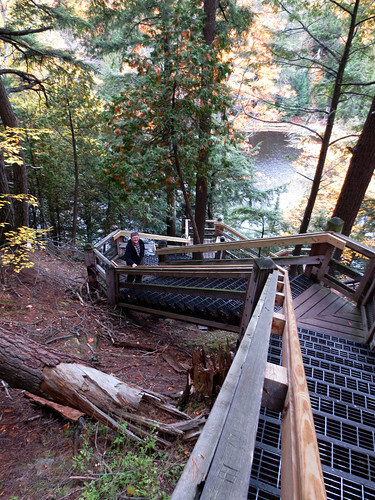 The upper falls trail offers several different perspectives. 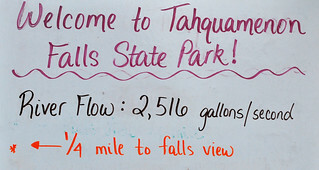 And that sign that said it was only a quarter of a mile to the falls? Well, they didn't tell me that much of that distance was vertical! And, just in case you were wondering.